An all-pilot crew of three is gearing up for a thundering liftoff on Tuesday atop a Soyuz FG rocket carrying them into orbit for a seven-month mission to the International Space Station. 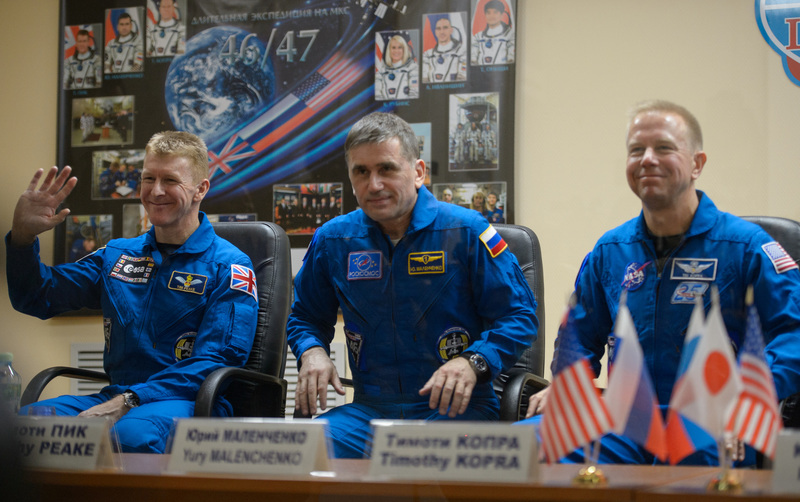 Veteran Soyuz Commander Yuri Malenchenko and Flight Engineers Tim Kopra and Tim Peake were cleared for launch on Monday by the Russian State Commission, approving the crew for flight. The Soyuz FG rocket, having been rolled to the launch pad under a star-filled sky on Sunday morning, received its traditional pre-flight blessing and is ready to head into an eight-hour launch countdown for blastoff at 11:03 UTC. Soyuz FG will be tasked with a nine-minute ascent mission to put the spacecraft into an orbit 200 Kilometers in altitude, chasing after the International Space Station that will pass over the launch pad just minutes prior to blast off. A series of engine burns will gradually raise the orbit of the Soyuz spacecraft to deliver it to the vicinity of ISS from where Soyuz TMA-19M will use its proximity navigation system to guide itself to an automated docking with the Rassvet module, currently set for 17:24 UTC, just over six hours into the flight. Opening the hatch about two hours after docking, the three arriving crew members will be greeted by the resident crew of Sergei Volkov and the two one-year crew members Scott Kelly and Mikhail Kornienko who will be welcoming their third visiting crew. With years of training approaching an end, activities for the three crew members were winding down over the past several days, allowing them to catch some rest ahead of an eventful and long day on Tuesday. They participated in the last pre-flight meetings with Mission Control to make sure they hit the ground running when arriving on ISS. They also tagged up with recovery forces who are making a quick transition from being in position for the landing of Soyuz TMA-17M on Friday to a deployment under the ascent path of the Soyuz for the unlikely event of a launch abort. On Monday, the Russian State Commission approved the prime crew for launch, the last formality prior to liftoff. A last pre-launch press conference was held at the Baikonur Cosmodrome before the crew went back to the Cosmonaut Hotel for a quiet evening and a few hours of sleep to get set for an early wake up on Tuesday. The crew will receive their wake-up calls around eight and a half hours prior to liftoff. Starting their day, the crew members typically plan much time for their final shower in the comforts of gravity for quite some time. The joys of flying to ISS begin with a whole-body disinfection to protect the carefully maintained environment aboard the Space Station, also requiring the crew to take microbial samples that are then analyzed as part of the various biological studies. At the Cosmonaut Hotel, the crew will have breakfast before packing their things for handover to their families since all their luggage is already aboard ISS or packed inside the Soyuz. They will then sign their hotel room doors and prepare to depart the Cosmonaut Hotel for the suit-up facility. 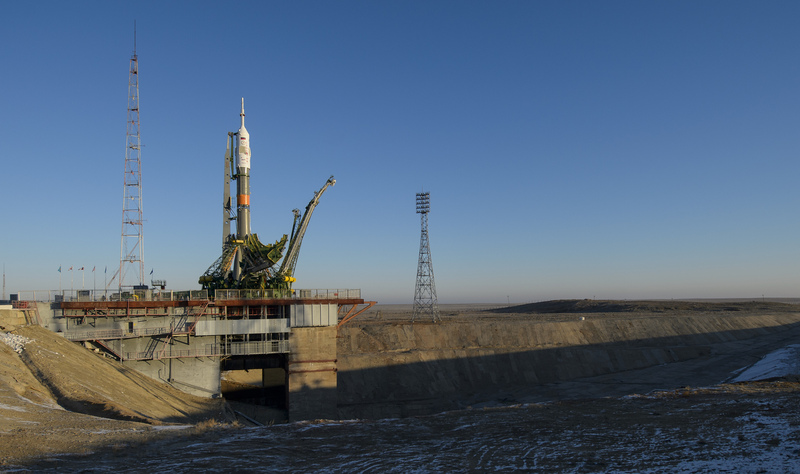 Out at Site 1/5, technicians will return to the launch pad to perform the final preparatory tasks for the Soyuz countdown operation and propellant loading. 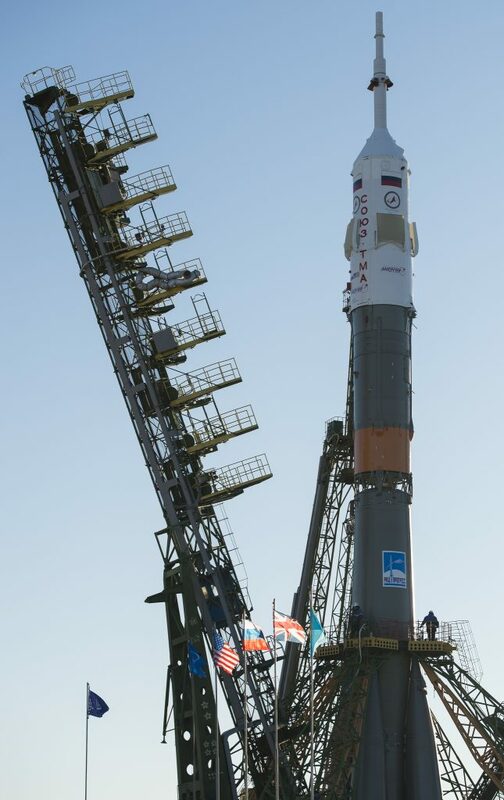 Countdown operations start eight hours prior to liftoff as part of a methodical procedure that prepares the Soyuz rocket and spacecraft for flight. After activation, the Soyuz rocket and spacecraft complete a series of Flight Control System checks, communication tests, propulsion system verifications and testing of the Launch Abort System. Over the course of the first few hours of the countdown, teams will install batteries on the booster, remove the core stage and booster engine covers and configure the interstage and launch shroud for liftoff, also closing out ground systems and the Service Structure. At L-5 hours and 30 minutes, the Russian State Commission convenes for the final pre-launch reviews of the countdown status to give the formal approval for Soyuz propellant loading. The Tanking Cars will have rolled to the pad by then, being connected to ground propellant systems to get ready to load the Soyuz with a total of 274,140 Kilograms of Kerosene and Liquid Oxygen. Propellant loading on the Soyuz FG rocker will commence just inside L-5 hours as the four boosters, the large Core Stage and the third stage on top are filled with refined Kerosene and -183°C Liquid Oxygen that starts flowing into the tanks after an initial chilldown. Additionally, each of the boosters receives 280kg of Nitrogen while the core is filled with 520kg to be heated up in flight to pressurize the propellant tanks. Previously, the boosters and core stage received Hydrogen Peroxide that will drive the turbopumps of the engines. While Soyuz is being loaded with propellants, the crew members will make their way from the Cosmonaut Hotel to Site 254 where they will undergo a last medical check and then ingress their Sokol Launch and Entry Suits, assisted by suit technicians. 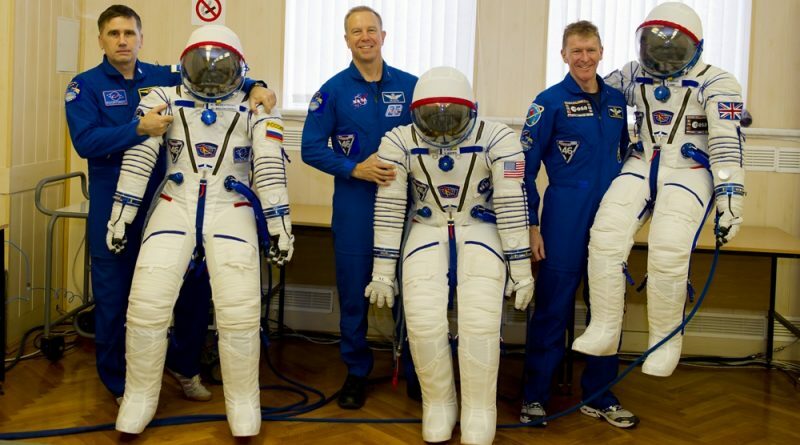 One-by-one, the crew members will enter a Kazbek seat liner and complete a suit leak check. 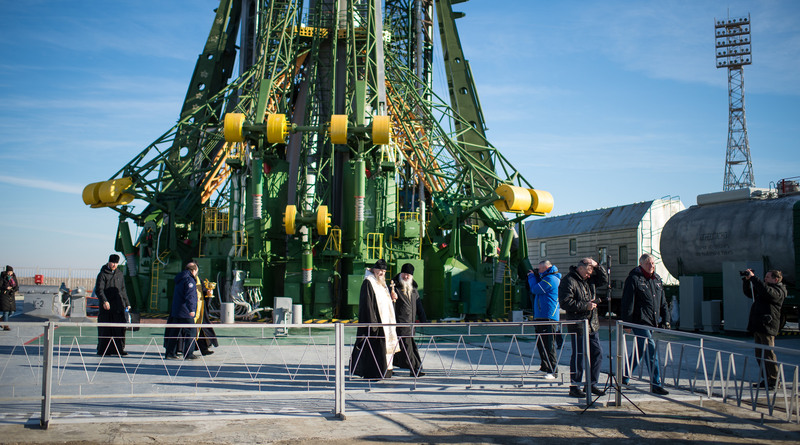 In the meantime, the other crew members can have a face-to-face conversation with their families and friends before departing Site 254 around three hours prior to launch for a 20-minute bus ride over to the historic launch pad at Site 1/5 from where Yuri Gagarin set sail on his flight in 1961. Propellant loading will wrap up just inside three hours when Kerosene tanks will be fully loaded and LOX and LN2 enter replenish. The Tanking Cars will be disconnected and depart the pad to made room for the arrival of the crew planned for L-2 hours and 35 minutes. 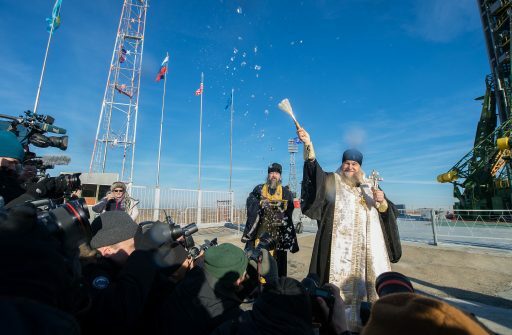 Arriving at the launch pad, the trio can marvel at their fully-fueled Soyuz rocket for a short moment, taking some time for photos with officials present at the pad and then walking over to their venting launch vehicle. The crew members will climb up the Service Structure stairs and wave good-bye before entering the elevator that takes them 40 meters up to their Soyuz spacecraft. Ingress of the Soyuz will start with the two Flight Engineers, entering the spacecraft through a hatch in the Launch Shroud that allows access to the side hatch of the Orbital Module. Climbing down into the Entry Module, Commander Yuri Malenchenko will enter the center seat of the spacecraft flanked to his left by Tim Kopra and to the right by Tim Peake. Once the crew is strapped in, teams will close the hatch of the Entry Module before closing out the Orbital Module and locking its hatch as well. This will mark the start of a series of leak checks on both hatches of the Soyuz spacecraft that will be pressurized for a period of pressure monitoring. Meanwhile, teams close out the launch shroud and start preparations for Service Structure retraction. Communication checks will be performed and the final round of Soyuz launcher and spacecraft tests begins at L-1 hour 45 minutes. Inside the Soyuz, the crew will start set up tasks as they work through the pre-launch checklist to properly configure the vehicle for launch. As the countdown enters a quiet period for them, the crew will be able to listen to music, pumped into the Soyuz through the communications system. Soyuz Guidance System activation occurs 60 minutes ahead of launch and flight computers receive the planned flight parameters 15 minutes later while the Soyuz TMA-19M spacecraft goes through all preparations to be ready for the transfer to internal power. The two halves of the Soyuz Service Structure will start lowering about 40 minutes prior to launch to clear the way for the Soyuz rocket. Service Structure power will be cut and at L-30 minutes, the Launch Abort System will be activated and placed in safe mode for final checks ahead of switching to Auto Mode at L-15 minutes, primed to trigger an abort from that point on all the way until orbital insertion. Technicians will clear the pad by L-15 minutes and the Soyuz spacecraft will be transferred to internal power and transition to its launch configuration. Ten minutes before launch, the inertial guidance system is configured for flight as gyroscopes are uncaged and flight recorders are activated. The Soyuz enters its Automated Countdown Sequence at T-6 minutes, beginning a highly choreographed set of steps to prepare its tanks, engines, electrical and flight control systems for blastoff. Inside the Launch Bunker, the launch key will be inserted to give final clearance for liftoff. Telemetry Systems are activated and the crew verifies that the Commander Controls are active and all displays are configured for flight. By that point, the three crew members will have closed their helmets and switched to suit air. Four minutes ahead of liftoff, the RD-107A and 108A engines of the core and boosters are purged with gaseous nitrogen to ensure a controlled ignition by removing any combustible substances. Propellant tank pressurization starts at T-2:35 and Soyuz makes its transfer to internal power one minute prior to launch, also assuming control of the countdown from the ground sequencer. The third stage umbilical is disconnected at T-50 seconds and the service tower retracts ten seconds later. Ignition sequence start is commanded at T-20 seconds when the hydrogen peroxide-driven turbopumps of the booster and core stage engines start spinning up – initially to a partial thrust mode before the engines ramp up to full thrust to allow the Soyuz to overcome hold-down weights and lift off. 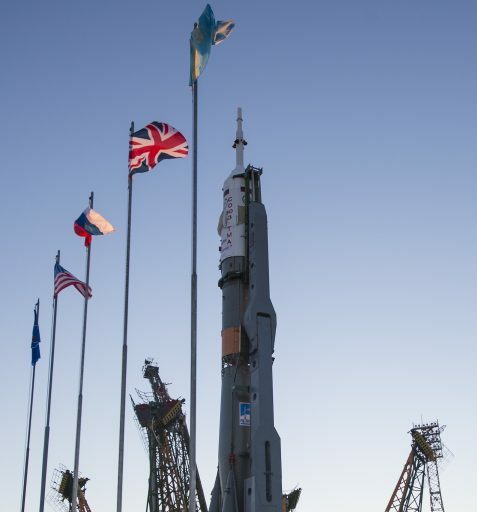 The thundering blastoff of the three former and future ISS Residents is planned at 11:03:09 UTC to allow the Soyuz to begin its chase of the Space Station that will have passed directly over Baikonur just minutes ahead of launch. Because the flight profile for the four-orbit link-up only has very tight margins, Soyuz only has a ten-second launch window. As clocks hit zero, the 50-meter tall rocket starts rising from its pad, lighting up the scenery at the Baikonur Cosmodrome. With a total thrust of 422 metric ton-force, the Soyuz will ascend vertically for about ten seconds as it starts its nine-minute trip into orbit. Quickly pitching over, the vehicle will start heading to the north-east towards the Russian border, aiming for its precise cutoff targets to deliver the Soyuz to an orbit at a 23.9-degree phase angle to that of ISS, trailing the station by over 3,000 Kilometers. Heading up the hill, the Soyuz passes Maximum Dynamic Pressure and Mach 1 around 70 seconds after launch with its boosters and core stage at full throttle, consuming 1,600kg of propellant each second of flight. One minute and 54 seconds into the flight, the Launch Escape Tower is Jettisoned marking the transition of the Launch Abort System to mid-altitude mode. The four boosters will shut down their engines at T+1 minute and 58 seconds after each consumed over 39,000 Kilograms of propellants to help the Soyuz accelerate on its way out of the atmosphere. Upon shutdown, the boosters are jettisoned by pyrotechnics and pistons that send them for a tumble back to Earth from an altitude of 49 Kilometers, headed for an impact 350 Kilometers from the launch site. It will be up to the Core Stage of the Soyuz to continue powered flight, firing its RD-108A engine that delivers 94 metric tons of thrust when flying in the rarefied upper atmosphere. Two minutes and 37 seconds into the flight, Soyuz will be passing 80 Kilometers in altitude when it will be safe to jettison the protective Launch Shroud – giving the three crew members a view of Earth and its thin atmosphere. Four minutes and 45 seconds after launch, the Core Stage will have done its job, shutting down its main engine and starting the hot-staging sequence two seconds later. An instant before pyrotechnics are fired, the RD-0110 engine of the third stage will start firing to pull away from the spent core once separated. The core remains on a sub-orbital path for impact 1,570 Kilometers from the Baikonur Cosmodrome. With a total thrust of 30 metric tons, the third stage will continue firing its four-chamber main engine and gimbaled verniers until T+8 minutes and 45 seconds, finishing the task of boosting the Soyuz into orbit. Three seconds after cutoff, the Soyuz spacecraft will separate from the upper stage which will open up a reaction nozzle to retreat from the separated spacecraft to decay naturally within two or three days. Immediately after arriving in orbit, the Soyuz will execute a series of pre-programmed steps based on time-tagged commands starting with the deployment of the two power-generating solar arrays and the KURS navigation antennas. Inside the Entry Module, the crew will reconfigure their displays and immediately start a functional test of the KURS system that has to be finished while Soyuz is still within range of Russian Ground Stations, making its way towards the Pacific Ocean. The four-orbit rendezvous requires the standard testing of KURS and other systems to be conducted in the first two orbits of the mission when there is still a prepared exit point from the six-hour mission profile. Now in control of the flight, Mission Control Moscow will verify that it is safe for the crew to loosen their shoulder straps and open their helmets as they settle in for a six-hour trip to ISS. Soyuz TMA-19M is targeting the standard insertion orbit of 200 by 242 Kilometers at an inclination of 51.67 degrees from where the spacecraft will link up with ISS through a series of propulsive maneuvers reaching the 398 by 409-Kilometer orbit of ISS, approaching from behind. After orbital insertion, there will not be much of a break for the crew. They will monitor the setup of the propulsion system of the Soyuz and track the attitude of the spacecraft to make sure the craft reaches a good orientation under the control of its DPO thrusters. Two rendezvous burns will be made on the first orbit of the mission using pre-programmed parameters to begin the process of raising the orbit of the Soyuz immediately, even without knowing the exact orbital parameters. Orbital tracking is performed after insertion and teams will calculate the orbit of the Soyuz after launch and after the two pre-set burns so that burns #3 and #4 on the second orbit can be modified to correct any insertion inaccuracies. The first rendezvous burn for Soyuz TMA-19M is planned at T+45 minutes (11:48 UTC) after commissioning the SKD main propulsion system by pressurizing propellant tanks and opening its protective cover. The burn is expected to last 71 seconds and change the velocity of the Soyuz by 28.54 meters per second, raising the orbit’s mean altitude by close to 50 Kilometers. This burn will be followed by the DV-2 maneuver at T+89 minutes, a 58-second SKD burn to increase the craft’s velocity by 23.57m/s, raising the perigee by 67 and the apogee by 26 Kilometers. 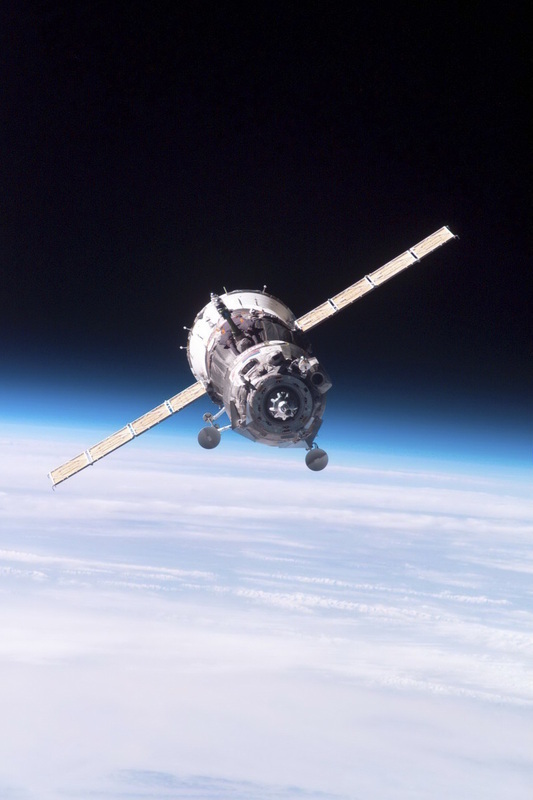 Passing over Russian ground stations after its first lap around Earth, Soyuz TMA-19M will continue testing operations and the crew will receive updated parameters for their next orbit that will again feature a pair of burns. DV-3 is planned two hours and three minutes into the flight to put the craft into an orbit of 298 by 337 Kilometers followed half an hour later by the next burn that targets an orbit of 319 by 337 Kilometers. In this orbit, the Soyuz will start its Automated Rendezvous Sequence at 15:15:55 UTC – a fully automated process that allows Soyuz to link up with ISS through KURS navigation data that is processed once the system becomes active at a range of around 200 Kilometers. Soyuz will conduct the DV-5 burn that will deliver it to that 200-Kilometer zone by 15:48 UTC when the KURS systems on ISS and the approaching spacecraft will be activated to provide navigation data to the computers of the Soyuz. The voice link between the Soyuz and ISS will be established around the same time, giving Mission Control a continuous voice and data link with the Soyuz. KURS performance will be verified as part of the standard short test to make sure the system is providing good navigation data to the Soyuz flight computer. Once entering the vicinity of ISS, the Soyuz activates its TV system and performs a number of rendezvous impulses with its small DPO thrusters to get ready for the Flyaround Sequence starting at a range of 400 meters at 17:01 UTC. The slow flyaround will line the Soyuz up with the Rassvet docking port, taking about ten minutes to complete. When sensing a good alignment, Soyuz will enter Stationkeeping, holding its rendezvous at a distance of just under 200 meters to allow the crew and Mission Control to perform a last-minute check of the alignment and Soyuz systems performance. Once the green light is given to the crew, Malenchenko will initiate the final approach by sending the appropriate commands to the Soyuz. Using its DPO thrusters, Soyuz initiates a slow closing rate and maintains a good alignment with the docking port, slowing down to about 0.1 meters for contact, also retracting one of its KURS antennas to clear the docking interface. Contact and capture is expected at 17:24 UTC (+/-3 minutes) to mark the arrival of three new crew members at ISS for a mission of seven months, supporting hundreds of experiments, spacewalks and cargo missions. Following docking, the docking probe of the vehicle will retract and hooks & latches will be closed to form a hard mate between Soyuz and ISS. The standard leak check operation will follow to ensure the seal between the Soyuz and ISS is tight. Hatch opening is planned around 19:25 UTC.